The last time the Flames met the New York Islanders, the Isles were very, very, very bad, arguably the worst team in the NHL at that time. They beat the Flames 2-1 in a game that was much closer than it should’ve been for the good guys. It took nearly the whole game for the Flames to score. It has been just a tad over three months since that game. The battle has shifted from the very worst against the borderline bad to the very improved versus the most improved. 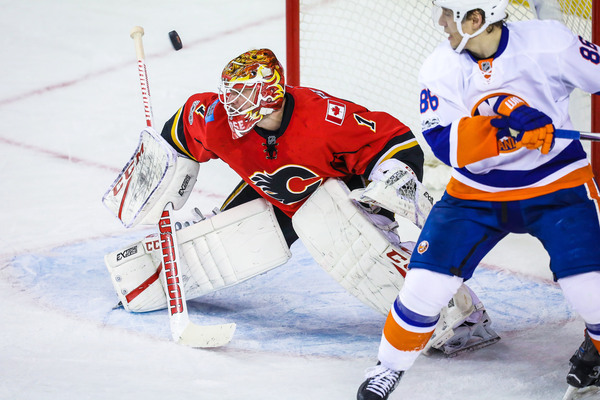 The Islanders now find themselves in a fierce dogfight for the Eastern Conference wildcard spot, while the Flames are now fighting for a top-three division spot. Last time, it took nearly 50 minutes for the Flames to score one goal. This time, it took them about five to score four. DZ faceoff win for 3M line results in heading up ice, causing havoc, and Frolik scores. TJ Brodie slides it in silently. He’s so deft with those hands. … for the Islanders to be done. The first was a very “if you build it, they will come” moment. 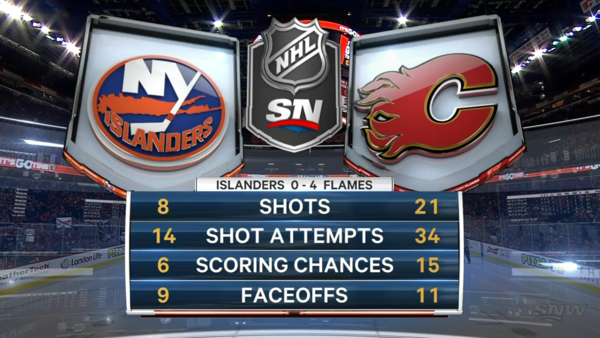 Even before the goalstorm started, the Flames were clearly the superior team. The team had deconstructed Doug Weight’s system before puck drop, put on the pressure, and then slammed the door shut. And as we prognosticated a while back, this is who the Flames really are. Perhaps you remember the second game of the season, where the Flames racked up 24 shots on goal in the first against the Oilers, but wound up losing 5-3. Also think back to the unfortunate streak of losses before the All-Star Break, when the Flames came out flying but fell flat on their faces after 20 minutes had passed. Heck, you could think back to last game against the Red Wings. Start out fine, get outshot 14-2 in the next period. This was a different game. This was a wire-to-wire victory in every sense of that phrase. The Flames took the corsi lead 16 seconds in, and didn’t relinquish it until there were just under three minutes left, when the Islanders tied the Flames in shot attempts in all situations. Even so, they never came out ahead of the Flames, and they didn’t even come close at 5v5. Hey guess who we’re talking about again. This afternoon, our #1 centre tied his career high for points (set last year) with an assist on the very first goal of the game. That assist also broke his previous high for assists, and his next goal will tie his career high for goals. There’s still 16 games to go in this season, so no worrying. There’s not much more to say other than what Ari said the embers previous when she declared him the MVP of this team. He’s wonderful and great. Once again, youth led the way yesterday afternoon. Dougie and Monahan had two point days, while Gaudreau and Bennett each added assists. With Hamilton’s two assists, he crosses the 40 point threshold for the season (and is now two points away from breaking his career high). That now means the Flames have four players who could all qualify for Team North America who have scored 40 points or more this season. Great work from Dougie waiting for Tkachuk who gets a chance and has another between-the-legs pass to Backlund. Will the third line truly come alive? If you want to explain the difference between October-January Flames and the February-March Flames, it all comes down to the lines. For the first four months, the Flames had two functional lines, 3M and Matt Stajan babysitting whoever (if your fourth line is the second best one, it is Not Ideal). Since Micheal Ferland moved up in mid-February, the Flames have had three functional lines. As this seven game win streak continues, we’re hopefully starting to see the emergence of a fourth functional line: Sam Bennett, Kris Versteeg, and Troy Brouwer (I would say Benny and the Vets, but they haven’t earned a cool nickname just yet). Since they’ve been formed as a line, they have a 47 CF% at 5v5. That’s not great, but consider that they were a 43.4 CF% line from October to New Year’s. From Jan. 1 to now, they’ve been a 49.7 CF% line, which is a considerable improvement. Not optimal, but manageable. So how do we make them manageable? The first step is to take away Brouwer, who has not been the main contributor on the line. Versteeg and Bennett have 67 and 55 5v5 individual shot attempts since Jan. 1. Brouwer has 29. This is not a working line with Brouwer, plain and simple. You could simply reunite Chiasson with Bennett and Versteeg, a line that was 59.5 CF% at 5v5 but sunk by a 92.6 PDO. If you really want to have some fun, put Curtis Lazar up there. His underlyings are just as bad (actually, way worse) than Brouwer’s, but he’s speedy and he’s got potential. If they paid a second, might as well use him. Another explanation for the ressurection of the Calgary Flames is Brian Elliott and his stellar play. Seemingly lost earlier in the season, the man acquired to be #1 has become the #1, yesterday’s game being his 13th start in the past 16 games. He’s been absolutely stellar. Elliott alone has muted the offences of recent opponents, and he doesn’t appear to be slowing down. There’s just one annoying milestone he has yet to hit: getting a shutout. Even when that achievement is in sight, it gets ended in a most meaningless way. Let’s go back to Jan. 4 against Colorado, another game the Flames lead 4-0 (against what was obviously the NHL’s worst team). With 85 seconds left, the Avs got their goal on what was their 17th shot of the game. And hey, let’s go further back to another time the Flames thrashed the Blues 4-1. In his former barn, and with the Flames quite clearly in control, they took two penalties within 17 seconds of each other and Elliott had his shutout ended 35 seconds later. It was a random and unlucky moment. The team had been disciplined and dominant up until that point, and then it ended. In blowout games like yesterday’s, the opponents scoring one goal or zero goals doesn’t really matter in the bigger picture, but damnit, it would be cool for him to get the shutout. It’s a great redemption story: his poor play nearly tanks the season but he turns it around and drags the Flames back into it. Elliott deserves at least one. While we’re waiting on the result of Anaheim’s game in hand (Tuesday against the Predators), let’s just enjoy the fact that the Flames are tied for third in the Pacific division. The question in January was whether or not the Flames would get a top 10 pick. The question in February was whether or not the Flames would stay in a wild card spot. The question for March will be what seed the Flames will finish in. For the first time this season, the Flames’ playoff chances are above 90%, per Sports Club Stats. The magic number is down to 13.5. There are 16 games left. It’s not going to get any easier: three of the next five games see the Flames face the Habs, the Penguins, and the Bruins. Those are not going to be easy hurdles, but the Flames have put themselves in a fantastic position. Flames 3, Islanders 1 post-game embers: Trades? Who needs those? I would love to see what what a line of Versteeg – Bennett – Lazar could do. Brouwer looks out of place on that current line. Elliot has been great during this winning stretch and Brouwer has struggled to contribute in any way, even physically. Is the loser point necessary or functional with the current OT format (3 on 3; Chris, Ari, Kent)? Just had a thought. I’m guessing your argument is that, with 3-on-3 OT, the loser point is unnecessary and ineffective as an incentive for teams to “go for the win”; that the open ice and the probability of scoring is sufficient to produce the desired result (of a goal). To that end, I’m wondering if maybe, if the objective is to avoid going to the shootout, it’d be worth considering lowering the SO win to one point, and the SO loss to no points. That, in my mind, should hugely incentivize risk-taking in OT, increasing the probability of a goal. What would you give up to Vegas so that they would promise to take Troy Brouwer? 2nd round pick? One of our defensive prospects? If they don’t take him, I think we have to start the buy out countdown. At this point I give him one more year… the need to resign backlund and concerns about fitting tkachuk into the cap will trigger it. The way the team has been playing lately I can see them holding their own and more with the Pens, Habs, and Bruins. The thing is, if you want Las Vegas to even consider taking Brouwer (which, if they’re doing their homework and actually scouting him, they would never do), you cannot scratch him. I would reckon you can’t even demote him to the fourth line. If I was Vegas, I would be asking for Andersson + to take TB off our hands in the expansion draft. I know Brouwer is the new whipping boy, now that Wideman has been demoted to the press box, but I’ll withhold judgement until after the playoffs. Yes he’s grossly overpaid but hopefully his playoff experience will balance that out. I can’t believe you mentioned Team NA. Each of the Flames top nine forwards has at least ten goals. that 5-1 goal has nothing to do with Bennett or Versteeg avoiding passing to Brouwer. The defenceman positioned himself to prevent a pass to Brouwer, and it is the best play he has. Stick takes passing lane and his body is taking a shooting lane away from Bennett. To cut off a pass to Versteeg he has to play across his body and could easily get twisted up by Bennett. By taking away the pass to Brouwer and filling there “inside” of the lane he is pushing Calgary’s shot to the goalie’s right. Bennett held on for as long as he could to keep the goalie off his post and then gave the puck to Versteeg who was left wide open. I understand the criticisms of Brouwer and the stats that were shared to back up that opinion, but I’m confused how anybody could interpret this play as anything other than the defenceman taking away as much as he could (which included a pass to Brouwer), then Bennett and Versteeg executing a great play with what they were left to work with. The comments on the play are clearly meant to be humorous, but they are so contrary to what actually happened that it comes off as childish. If you need to force a joke, it’s not a very good joke. Any chance with this new and improved FlamesNation layout you could also start replacing the SportsClubStats references with Micah McCurdy’s more credible predictions?